Today I was to disembark for the last time. Before I did so I made sure I had one last hearty breakfast in the Saga Restaurant. A lot of guests were up and about early like myself as we were due to arrive in Trondheim at 06.30 am where many passengers were disembarking. 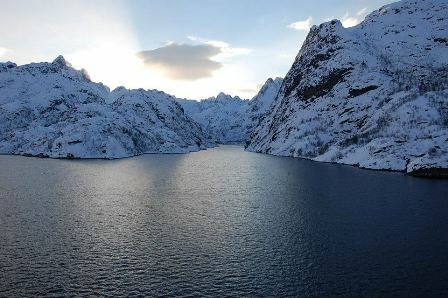 Hurtigruten had asked all guests to vacate their cabins by 08.30, they provided a secure area for luggage to be stored until guests disembarked. Disembarkation was quick and easy, our coach was waiting for us a few metres away. The transfer to Trondheim airport was only 20 minutes so before we knew it we were checked into our direct flight back to London Gatwick. When touching down in dreary grey Gatwick I was quite sad that it was all over. It was such a wonderful destination, ship and overall experience. Hurtigruten totally exceeded my expectations. The ship was far more well equipped that I imagined with really comfortable public areas, wonderful food and very pleasant staff. Cruising with Hurtigruten is very different to other cruise lines I’ve been lucky enough to travel with (Silversea, Regent, Crystal and Seadream). The atmosphere onboard is incredibly relaxed. The guests onboard are there to visit the destination rather than sip on champagne and eat the finest caviar. I found the staff very friendly and obliging, but not necessary anticipating your next move. A few times I thought the bar could offer table service or perhaps come round with coffee at breakfast rather than having to help yourself. The ship was prompt with it’s arrivals and departures and the excursions I took part in were interesting and well organised. I enjoyed the little extra’s they arranged, which almost felt impromptu, like the cod liver oil ceremony when crossing the Arctic Circle, or a slight deviation to allow guests to look down the mouth to the Trollfjord. 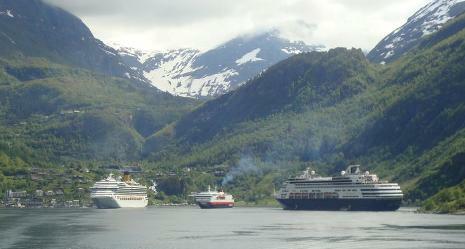 If anyone reading this is thinking about taking a cruise to the Norwegian Fjords I urge you to consider Hurtigruten. You will have such a wonderful, unique experience with an authentic Norwegian atmosphere. Click here to read about Day 1, 2 and 3. 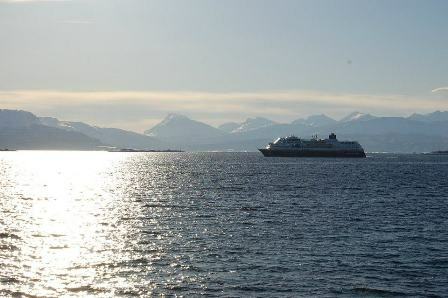 Watch a video of a Hurtigruten summer sailing.